پوربیرانوند, شاهرخ, شمالی, ظاهر حسین. (1391). محاسبه تانسور تنش براساس وارون‌سازی سازوکار کانونی زمین‌لرزه‌‌ها و کاربرد آن در منطقۀ مکران. 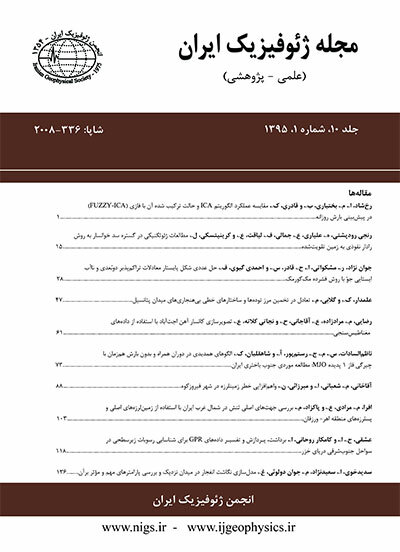 مجله ژئوفیزیک ایران, 6(2), 1-19. شاهرخ پوربیرانوند; ظاهر حسین شمالی. "محاسبه تانسور تنش براساس وارون‌سازی سازوکار کانونی زمین‌لرزه‌‌ها و کاربرد آن در منطقۀ مکران". مجله ژئوفیزیک ایران, 6, 2, 1391, 1-19. پوربیرانوند, شاهرخ, شمالی, ظاهر حسین. (1391). 'محاسبه تانسور تنش براساس وارون‌سازی سازوکار کانونی زمین‌لرزه‌‌ها و کاربرد آن در منطقۀ مکران', مجله ژئوفیزیک ایران, 6(2), pp. 1-19. پوربیرانوند, شاهرخ, شمالی, ظاهر حسین. محاسبه تانسور تنش براساس وارون‌سازی سازوکار کانونی زمین‌لرزه‌‌ها و کاربرد آن در منطقۀ مکران. مجله ژئوفیزیک ایران, 1391; 6(2): 1-19. اطلاع از چگونگی تغییرات تنش در پوسته برای درک وضعیت ژئودینامیک و تحقیق زمین‌ساختی منطقۀ مورد بررسی لازم است. در این نوشتار ضمن بیان مبانی نظری وارون‌سازی تانسور تنش با استفاده از سازوکارهای کانونی زمین‌لرزه‌ها، به معرفی دو رویکرد خطی و غیرخطی در این موضوع پرداخته شده و دو روش برگزیده از هریک از این رویکردها به‌‌طور خلاصه توضیح داده شده‌‌اند. سپس هر دو روش روی یک مجموعه دادۀ شناخته شده که مربوط به درۀ دیکسی در ایالت کالیفرنیای ایالات متحد امریکا می‌شود، درحکم دادۀ مصنوعی آزمایش شده و نقاط قوت و ضعف روش‌‌ها مورد ارزیابی قرار گرفته است.. سپس با توجه به اهمیت منطقۀ مکران در جنوب ایران و پاکستان و نقش اساسی بررسی تنش در ارزیابی وضعیت زمین‌ساختی این منطقه، از داده‌‌های مربوط به منطقۀ مکران درحکم دادۀ واقعی برای پیاده‌‌سازی روش استفاده شد. در انتها براساس وارون‌سازی تنش با استفاده از سازوکارهای کانونی موجود در منطقه، راستای تنش در مکران غربی برابر با 4 ± 6/17 درجه، در مکران مرکزی 3 ± 2/38 درجه و در قسمت شرقی مکران 4 ± 0/157 درجه به‌دست آمده است. In this study after considering the importance of the stress filed and its applications in different branches of earth sciences, the focal mechanism stress inversion techniques were reviewed in a short way. Although the problem in hand was highly nonlinear, according to the benefits of the linear approaches some authors have tried to linearize the problem by making some extra assumptions in addition to the assumptions that all stress inversion methods share i.e. homogeneity of the stress tensor in the area or assuming the slip direction to be in the direction of maximum shear traction. Therefore two different approaches, linear and nonlinear methods were investigated in this study. Then two major methods from each division namely Michael (1984) from linear approaches and Lund and Slunga (1999) from the nonlinear ones, were selected and the main aspects of each method were shortly described without entering into details. After that each method was applied to a dataset from a previously studied and widely known area in California, United States of America, to ensure the validity of the results. The results from both methods showed good agreements with the expected results based on the successful studies in the area about the stress field performed by Angelier (1979). Some of the differences observed in the results from different methods are due to the way they make choice between the nodal plains. In Michael (1984) method this choice is being made during the bootstrap randomly, thus there is a similar chance for each nodal plane to be selected as a fault plane. This increases the ability of the method to deal with the noisy data. On the other hand Lund and Slunga (1999) method has the ability to select the fault plane based on two different methods which are slip angle and instability. The experience of using these methods shows that the Michael (1984) method generally gives an average orientation of the maximum horizontal stress that approximately occurs between the two methods introduced by Lund and Slunga (1999). Finally the methods were applied on a dataset from Makran region which is placed both in Iran and Pakistan. The result of the stress inversion of all available data from Makran was an average of the SHmax (maximum horizontal stress) directions in the area and therefore the dataset was divided into three different parts: western, central and eastern. The result showed an interesting variation in the maximum horizontal stress directions. Different methods used in this study showed a good agreement again and this led to the higher reliability of the stress directions in Makran. Angelier, J., 1979, Determination of the mean principal directions of stresses for a given fault population, Tectonophysics, 56, T17-T26. Angelier, J., 1984, Tectonic analysis of fault slip data sets, J. Geophys. Res., 89, 5835-5848. Angelier, J., 1990, Inversion of field data in fault tectonics to obtain the regional stress, III. A new rapid direct inversion method by analytical means, Geophys. J. Int., 103, 363-376. Armijo, R., Carey, E. and Cisternas, A., 1982, The inverse problem in microtectonics and the separation of tectonic phases, Tectonophysics, 82, 145-160. Bott, M. H. P., 1959, The mechanics of oblique slip faulting, Geol. Mag., 96, 109-117. Byrne, D. E., Sykes, L. and Davis, D. M., 1992, Great thrust earthquakes and aseismic slip along the plate boundary of the Makran subduction zone. J. Geophys. Res. 97, 449–478. Carey, E. and Brunier, B., 1974, Analyse théorique et numérique d'un modèle méchanique élémentaire appliqué à l'étude d'une population de failles, C.R. Acad. Sci. Paris., 279, 891. Etchecopar, A., Vasseur, G. and Daignieres, M., 1981, An inverse problem in microtectonics for the determination of stress tensors from fault striation analysis, J. Struct. Geol., 3, 51-65. Gephart, J. W. and Forsyth, D. W., 1984, An improved method for determining the regional stress tensor using earthquake focal mechanism data: Application to the San Fernando earthquake sequence, J. Geophys. Res., 89, 9305-9320. Jaeger, J. C. and Cook, N. W. G., 1979, Fundamentals of Rock Mechanics, Chapman and Hall, New York, third edition. Lund, B., 2000, Crustal stress studies using microearthquakes and boreholes, PhD thesis, Uppsala University. Lund, B. and Slunga, R., 1999, Stress tensor inversion using detailed microearthquake information and stability constraints: Application to Olfus in southwest Iceland, J. Geophys. Res., 104, No. B7, PAGES 14,947-14, 964. Lund, B. and Townend, J., 2007, Calculating horizontal stress orientations with full or partial knowledge of the tectonic stress tensor, Geophys. J. Int., 170, 1328–1335. Magee, M. E., 1997, Crustal stress state inferred from earthquake focal mechanisms: Recognition of a non-uniform stress state, slip plane selection criteria and implications for the mechanics of faulting, Ph.D. thesis, Stanford Univ., Stanford, Calif., USA. McKenzie, D. P., 1969, The relation between fault plane solutions for earthquakes and the directions of the principal stresses, Bull. Seismol. Soc. Am., 59, 591-601. Michael, A. J., 1984, Determination of stress from slip data, Faults and folds, J. Geophys. Res., 89, 11517-11526. Parker, R. L. and McNutt, M. K., 1980, Statistics for the one-norm misfit measure, J. Geophys. Res., 85(B8), 4429 – 4430. Quittmeyer, R. C. and Kafka, A. L., 1984, Constraints on plate motions in southern Pakistan and northern Arabian Sea from the focal mechanism of small earthquakes. J. Geophys. Res. 89, 2444–2458. Reches, Z., 1987, Determination of the tectonic stress tensor from slip along faults that obey the Coulomb yield condition, Tectonics, 6, 849-861. Shad Manaman, N., Shomali, H. and Koyi, H., 2011, New constraints on upper-mantle S-velocity structure and crustal thickness of the Iranian plateau using partitioned waveform inversion, Geophys. J. Int. 184, 247–267. Slunga, R., Rögnvaldsson, S. T. and Böðvarsson, R., 1995, Absolute and relative locations of similar events with application to microearthquakes in southern Iceland, Geophys. J. Int., 123, 409-419. Vernant, P. and Ch´ery, J., 2006, Mechanical modelling of oblique convergence in the Zagros, Iran, Geophys. J. Int., 165, 991–1002. Wallace, R. E., 1951, Geometry of shearing stress and relation to faulting, J. Geol., 59, 118-130. Zarifi, Z., 2006, Unusual subduction zones: Case studies in Colombia and Iran: PhD. Thesis, University of Bergen.